Counting in English is painfully slow: “two hundred seventy one, two hundred seventy two, two hundred seventy three.” For the reasons mentioned in this post, I want to have a kind of unconscious mental reference point in my brain, that is as short as possible, for each image/number. After I get all of the images burned into my mind, I will drop the phonetics during memorization, but I want to be able to think in numbers very quickly. “Two hundred seventy one, two hundred seventy two, two hundred seventy three” is 21 syllables. I count it in my head with three: “NET NEN NEM”. I’ve already reduced everything in my 3-digit system to one-syllable. Over the past week, I also reduced all my 1- and 2-digit images to one syllable each in the way described here. With 3-digit numbers, an example would be 066 802 610 which is “SIHB FON BIS” – images of Cybill Shepherd, telephone, bees, though I wouldn’t say or think the longer words. The 2-digit images were originally built as consonant-consonant, with a vowel added to the beginning of the word. 20 was “Einstein” and 21 was “antelope”. I’ve shortened all of them to one syllable. 20 is an image of Einstein, but is now read as “NO”. 21 is still “antelope” but is read “NI”. So, 06 68 02 is read “SIH BEI SU” — the woman from the sushi shop repairing a tank. 1-digit numbers are read as their vowel sounds. 0 is “O” and an image of a soccer ball. 1 is “I” and an image of a candle. Keeping it strictly phonetic makes the system work for words and names, by providing specific images for 2,798 unique sounds (not including the images just for letters and sounds). 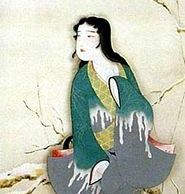 An example would be the Hawaiian word kokua: ko  ku  a , or an axe, yuki-onna, and black flag. In practice, I probably won’t need images for every sound, but just a few images here and there as reminders. Another use could be memorizing poetry or other text. Words that I’m likely to confuse with other words can be given an image or two as reminders.